Once again I haven’t made a ton of progress on either my book or my cowl this week. But after several busy weeks in a row I’ll have almost two weeks of a very light workload, and I’m excited about catching up. I’ve read a hundred pages of The Castle Cross the Magnet Carter and still don’t know what the title means, but I promised I wouldn’t complain until the 200-page mark and intend to keep that promise. And all the curiosity piqued by all those interlocking disembodied hands more than makes up for the confusing title, don’t you think? I don’t know what the hands mean either, but I’m about 63% sure there are some Faulkner references wiggling their wormy little way to the surface – The Sound and the Fury references, to be exact. More soon. Happy Wednesday, internet friends. 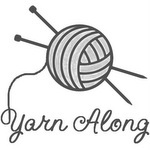 Yarn Along is hosted by Ginny on her blog, Small Things. Sometimes I’ll check out a book if the cover intrigues me. Nice looking cowl. That will so cozy and warm in a few months for sure!